With the engine and gearbox swap complete it was literally only a few hours later that Merlot Black took to the race track for the very first time. 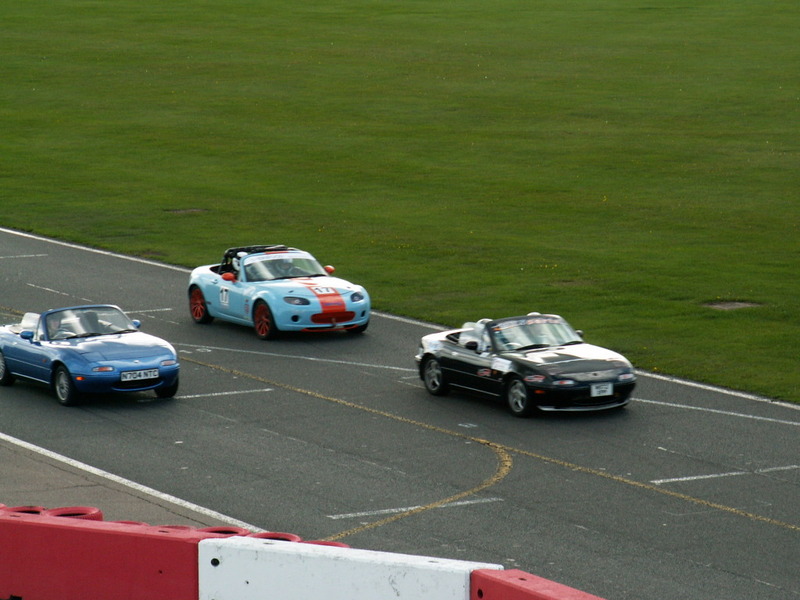 Friday morning saw Robbie, Martin and Jon at Silverstone Stowe circuit for the MX-5 Owners Club National Rally track day with Mazda on Track. With so much work having been recently completed Robbie was visibly nervous, not something we see often, and a few spots of oil on the ground and a leaky brake calliper did not make things better! So it was with some trepidation that Robbie took to the wheel on track for the very first time on the sighting lap, followed by Martin, and then the final test, the first proper laps with Jon at the wheel and Robbie sitting, still nervous, in the passenger seat. Why were we worried? Within a few laps it was clear that Project Merlot was back. With about 45 full throttle laps being completed in the morning session, in wet and dry conditions, by lunch time there was no doubt about the car any more, and to quote Robbie’s last blog entry, “its just the same as Project Merlot, but Black”.! The afternoon was sessioned and it gave us the opportunity to put a brand new novice track driver in the seat. Eastern Region member Carole, with Robbie instructing, had the time of her life behind the wheel, and I think Black has a new track day convert at first attempt. After the high speed action on Saturday it was show time on Sunday. Black was entered in to the hot five competition at Billing Aquadrome. No trophy this time, but then Project Merlot never was about show, but all about go. A big thank you to Team Merlot for letting me loose on their car at Silverstone on Saturday! It was the first time I'd done a track day, and I felt honoured to be allowed to drive the reincarnation of Merlot so soon after its extensive 'surgery'. Robbie's tuition was spot on - I had an absolutely fantastic time, adjectives fail to do justice to the experience. I still haven't come down and am boring all my family and friends with accounts of the day! The car is a dream to drive, so quick and responsive (sorry about the rev limiter...) and I was relieved to see it recovered ok to be at the National the next day. I'd love to drive again (if you'll let me) and would recommend it to anyone to have a go! It was cutting it fine but Merlot Black's engine transplant is complete and the car is ready for a proper track outing at Silverstone's Stowe circuit on Saturday. Once the engine installation was complete, the car initially failed to start. After a wasted hour of checking the newly installed wiring harness (taken from Project Merlot and which is slightly different to the one that was removed from Merlot Black) the cause was in fact wrongly fitted fuel pipes! "It was a school boy error but once I'd eliminated the wiring harness as the cause, diagnosis was quick" Robbie claims, "With the pipes fitted the correct way round, the engine started on the button!" With all the parts swapped from Project Merlot, Merlot Black really is a carbon copy of the original car and unsupprisingly feels just the same to drive. Eastern Region member and previous Project Merlot driver Kevin Shields gave a helping hand all day to get Merlot Black back together for Silverstone. Thanks Kevin. The old smokey engine is hoisted out complete with transmission... Now where have you seen a photo like this before? By 9:30pm the new (old) engine was in but Robbie knew there was no beer in the fridge so he had to throw down his overalls and call it a night before the local Spar shop shut. In should be fully up and running by the end of tomorrow. After returning from the Norfolk Gala day and discovering an oil consumption figure of 0.8litre/150miles and with less than a week until Merlot Black's track debut on the Stowe circuit at Silverstone, it was decided to transplant the engine and gearbox with the powertrain recently removed from Project Merlot. Merlot "Black" attended its very first event today when it took up a place on the MX-5 Owners Club stand at the Norfolk Gala Day. Its certainly looking good now, but we still have an issue with a bit of a smoky exhaust! In a moment that would have been even better had someone actually had their camera switched on Eastern Region member John Mellor decided to check out the quality of the smoke whilst Robbie revved the engine.! John waved his hand in front of the tail pipe just as Robbie revved the engine. Rusult: one very black hand, Conclusion: its burning a bit of oil! Well it is Merlot "Black"
The other curious revelation is the front number plate which bears the rather odd message in the small print at the bottom, "I love my chicken" Weird or what ? After 8 hours solid work Merlot Black is looking like a track car. Robbie worked all day to fit the lowered suspension, poly bushes, HEL brake hoses and EBC discs removed from Project Merlot. Robbie also replaced the left hand rear wheel bearing and fitted the steering rack from Project Merlot following advisories on it's recent MOT test. Finishing the day off with a steering geomotry set up on EMG Motor Group's Visualiner 4 wheel alignment equipment, he also found time to install the front lip spoiler. Leaving just the smokey engine to attend to. Merlot Black looks all on track to attend the Owners Club's National Rally and Silverstone circuit and Billing Aquadrome on 17th and 18th September.